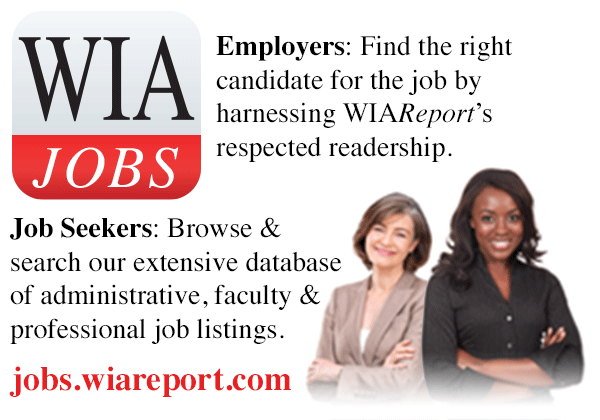 For the eighth year in a row, WIAReport has surveyed the nation’s highest-ranking research universities to determine the percentage of women in this year’s entering classes. We also report on gender differences in acceptance rates at these schools and whether women have made gains in enrollments at these universities compared to where they were a year ago. Of the 28 high-ranking universities for which we have data, women were a majority of the entering students at 18 schools. Three years ago, women were a majority of the first-year students at only 11 high-ranking universities. There are wide variations in the percentage of women in the first-year classes at these highly rated universities. For the eighth year in a row, the highest percentage of women in the entering class among this large group of leading research universities is found at the University of North Carolina at Chapel Hill. There are 2,669 women among the 4,326 entering students at UNC this year. Thus, women make up 61.7 percent of all first-year students, up slightly from a year ago. 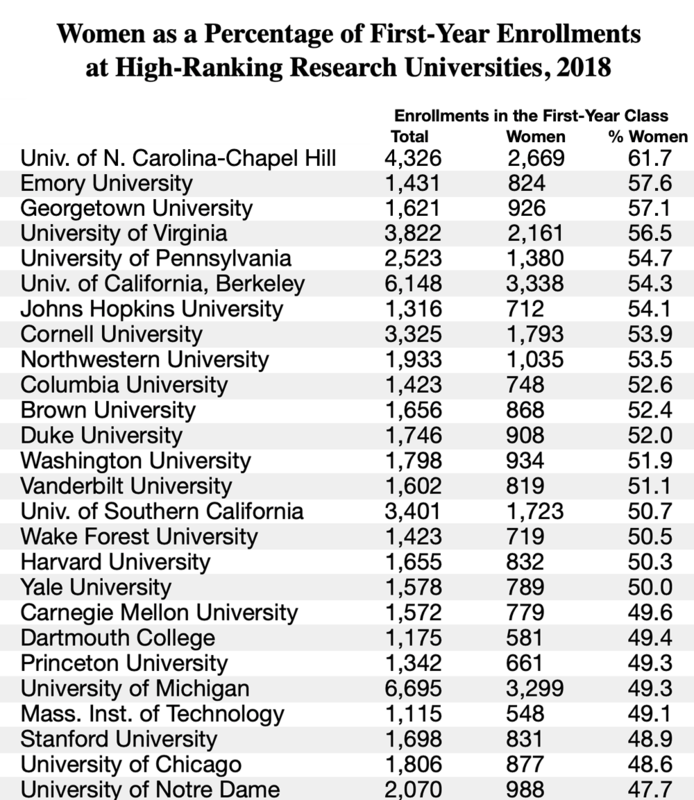 For five of the past seven years, including this year, Emory University in Atlanta had the second-highest percentage of women in its entering class among this group of leading research universities. This year, women make up 57.6 percent of the entering class. 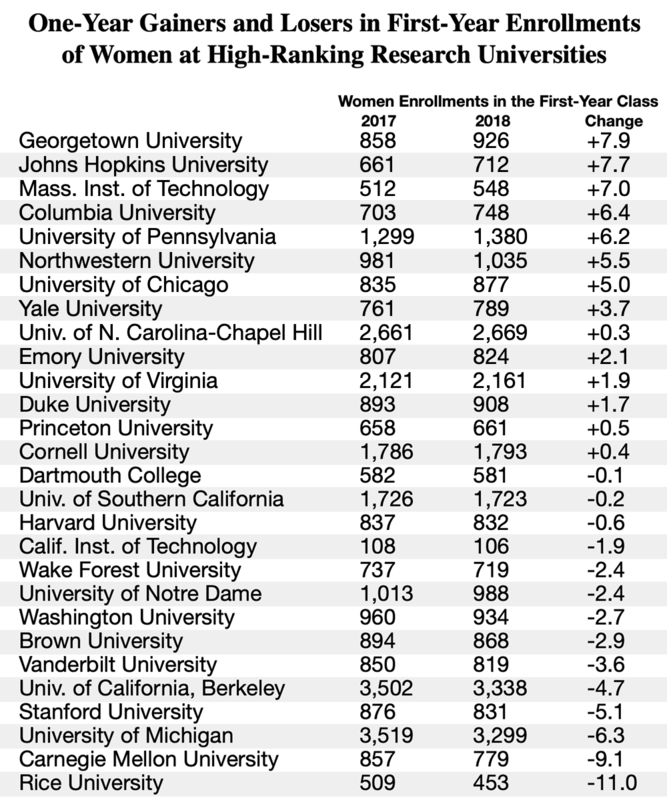 Georgetown University in Washington, D.C. placed third in our survey this year with an entering class where women make up 57.1 of all incoming students. Wmen are 56.4 percent of the first-year class at the University of Virginia. At the University of Pennsylvania, the University of California, Berkeley, and Johns Hopkins University in Baltimore, women make up more than 54 percent of first-year students. At Cornell University in New York and Northwestern University in Illinois, women are more than 53 percent of students in the entering class. At the other extreme, the California Institute of Technology has an entering class where women are 46 percent of all first-year students. This is the lowest percentage among high-ranking universities in our survey group. However, five years ago, women made up only 35 percent of the entering class at CalTech. Rice University in Houston and the University of Notre Dame in Indiana each have an entering class where women are less than 48 percent of all students. Three years ago, Carnegie Mellon University in Pittsburgh had an entering class where women made up 45.9 percent of all first-year students. This was the lowest percentage in our survey that year. Carnegie Mellon has a large number of students in engineering and STEM disciplines. Last year, women were a majority of the entering class. This year, there are 14 more men than women. A year ago, there were 658 women and 648 men in the first-year class at Princeton University in New Jersey. This was the first time in the history of Princeton University that women have outnumbered men in an entering class. This year women make up just under half of the students in the entering class. We can compare last year’s results to the current data to see where women are making progress. Of the 28 leading research universities for which we have data in both years, 15 schools show an increase in the number of women first-year students and 13 show a decline. It must be noted that an increase in the number of women in the first-year class may not reflect a fluctuation in the gender ratio but may simply result from more students overall in the first-year class. Georgetown University showed the largest one-year increase in women in its entering class. There are 926 women in the first-year class, compared to 858 in the 2017-2018 academic year. This is an increase of 7.9 percent. Johns Hopkins University and MIT also posted increases of more than 7 percent. At Columbia University in New York and the University of Pennsylvania, the number of women in the entering class was up by more than 6 percent. Northwestern University and the University of Chicago posted gains of 5 percent or more. Rice University and Carnegie Mellon University both had decreases in the number of women in their first-year class of more than 9 percent. It is well known that nationwide women outpace men in college enrollments, graduation rates, and degrees earned. Because of a large and growing gender gap in enrollments at many colleges and universities, it has become easier for men to gain admission to some colleges and universities. It must be noted that just because men have a higher acceptance rate than women at a given institution does not necessarily mean that men have received an unfair admissions advantage. A particular college or university may simply have had an outstanding pool of male applicants in a given year. We do note that many high-ranking universities are reluctant to report gender differences in acceptance rates. This year, only 18 chose to do so. We will simply present the data and let readers make their own conclusions. The greatest difference was at Carnegie Mellon University, which as stated is heavily focused on STEM disciplines. At this highly rated university, 23.7 percent of women were accepted for admission compared to only 13 percent of male applicants. Thus, there was a very large acceptance rate gap in favor of women of 10.7 percentage points. However, the gender gap is narrowing. A year ago the gap was 14.5 percentage points. The next highest acceptance rate gap in favor of women was 5.7 percentage points at MIT. The only other leading research university where the accepted rate for women was three percentage points higher than the rate for men was the University of California, Berkeley. 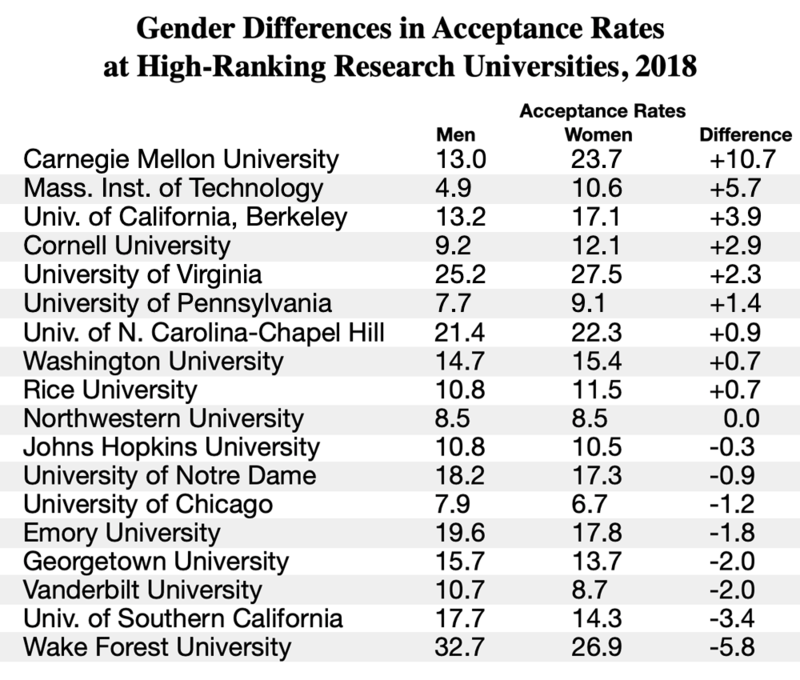 At the other end of the spectrum, Wake Forest University in Winston-Salem, North Carolina, had the highest gender gap in acceptance rates in favor of men. At Wake Forest, 32.7 percent of male applicants were accepted compared to 26.9 percent of women applicants. The University of Southern California was the only other high-ranking research university where men were accepted at a rate at least three percentage points higher than women.